Inelastic behavior and failure of materials, particularly deformation instabilities in brittle rocks and granular media, including their interactions with pore fluids, with applications to fault instability, quantification of energy radiation from earthquakes and environment- and resource-related geomechanics. Award for Outstanding Research in Rock Mechanics from the U. S. National Committee on Rock Mechanics (shared with J. R. Rice), 1977. 5. John W. Rudnicki, Fundamentals of Continuum Mechanics, 199 pages, John Wiley & Sons, Ltd., ISBN 978-1-118-47991-9, 2015. 6. J. R. Rice, J. W. Rudnicki, and J. D. Platt, Stability and Localization of Rapid Shear in Fluid-Saturated Fault Gouge, 1. Linearized Stability Analysis, Journal of Geophysical Research - Solid Earth, 119, 4311-4333, doi:10.1002/2013JB010710, 2014. 7. J. D. Platt, J. W. Rudnicki, and J. R. Rice, Stability and Localization of Rapid Shear in Fluid-Saturated Fault Gouge, 2. Localized Zone Width and Strength Evolution, Journal of Geophysical Research - Solid Earth, 119, 4334-4359, doi:10.1002/2013JB010711, 2014. 8. J. W. Rudnicki, 2011 Drucker Medal Paper: Localized Compaction in Porous Sandstones, Journal of Applied Mechanics. 80(6), doi:10.1115/1.4025176, 2013. John Rudnicki teaches a variety of mechanics courses at both the undergraduate and graduate levels. Undergraduate courses he has taught recently include Engineering Analysis 2, Mechanics of Materials and Mechanics of Sports. 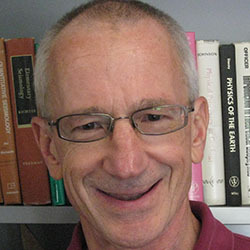 At the graduate level, he regularly teaches Mechanics of Continua I and has taught Mechanics of Continua II, Inelastic Constitutive Relations for Solids, Plasticity, Fracture Mechanics and Elasticity.